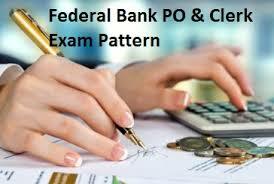 Today I am going to tell you about Federal Bank Exam Pattern for Officers as well as Clerks. Federal Bank Clerks and Officers recruitment has been announced. My suggestion is that if you are looking for Bank Jobs you should surely try for these jobs. The reason is that Federal Bank is one very good Bank which provides very good work environment to its employees. While there is a lot of work pressure in most of the Bank, Federal Bank is quite different as it provides a conducive work environment to its employees. So try hard for these jobs. The first step for preparation is to have a good knowledge about the exam pattern. I am explaining here Federal Bank Exam Pattern for Officers as well as Clerks. Hence there will be total 150 questions of 150 marks. The composite time will be 90 minutes. There is no sectional time limits. Hence there will be total 90 questions of 90 marks. The composite time will be 60 minutes. There is no sectional time limits. There will be negative marks at the rate of 0.25 for each wrong answer. The qualifying criteria will be decided by the Bank as per its selection / recruitment policy. So these were the details of Federal Bank Exam Pattern for Officers as well as Clerks. Please also go through official notification for further details.